NPlus1 is an organization designed to assist architects and lead developers and those aspiring to these roles. The organization began last year with the launch of the NPlus1.org web site. This site features articles written by and for architects; links to screencasts and other resources; and announcements of upcoming events. Recently, NPlus1 decided to expand its reach by organizing events of its own. One of these events - the Architecture Summit - takes place Friday July 31 at the Microsoft office in Southfield, MI. This event will feature three topics: "Introduction to Object Oriented Programming"; "Software Patterns"; and "How I Learned to Love Dependency Injection". The first topic is optional, as it is aimed at those who are new to Object Oriented Programming and, therefore might struggle with the concepts presented in the other two presentations. I will be delivering the first two presentations (Intro to OOP and Software Patterns) while James Bender will deliver the Dependency Injection presentation. I have been a fan of TechSmith products for years. In this interview, TechSmith Chief Evangelist Betsy Weber describes the products offered by her company and the uses of those products. Michael Eaton slumped in his chair and allowed his arms to fall to his side. Ten minutes earlier, he had been rushing up the stairs to find a designer to help out a team in need. But now, relaxing in a quiet room with the door closed, the lack of rest began to catch up to him. Two hours sleep Friday night on a classroom floor with a coat for a pillow seemed an appropriate way to cap off months of preparation for the 2009 Ann Arbor Give Camp. It was Saturday afternoon and the 3-day camp was about half over, but every indication pointed to a successful event. Sixty developers descended on Washtenaw Community College (WCC) and were huddled together in teams - furiously designing and writing code for charities. Many representatives of these charities were on hand, providing clarification of requirements or content or moral support. In all, the teams were supporting eighteen charities. They wrote web sites and contact management systems and various pieces of software that the charities would be unlikely to afford on their own. They donated their weekend because they believed in this cause. So, of course, I asked Mike about next year. "Fifty charities", he insisted. Fifty is nearly triple the number of charities helped this year, but Mike was determined to make it happen. As he spoke about this, his energy returned. He talked of lessons learned and how to handle the scale for next year. One key is to get started planning earlier - within the next few weeks. The goal is to get the charities and developers lined up early next year in order to be ready for the Give Camp in July. Bringing back the same planning team is important, he said. This year, Mike drew heavily on the knowledge of Jennifer Marsman, who organized last year's Give Camp. He had already spoken with WCC and reserved their conference center - a building with facilities and rooms large enough to accommodate the hundreds of developers needed to support 50 charities. Mike talked about the challenge of picking teams. Identifying appropriate skill sets was difficult, given that there were a lot of people unknown by the planning team. Next year, he plans to gather more specific information from each developer in order to better evaluate their experience and place them on the correct team. Mike stopped short of committing to take charge of next year's Give Camp, but it was clear from his enthusiasm that he wanted to be heavily involved. He did not hide his passion for what everyone was doing this weekend. The energy of this event was infectious. A developer in Phoenix, AZ plans to put on a Give Camp in his area, so he flew to Michigan to experience one for himself and learn what worked. WCC donated the facilities and accommodated the numerous requests they had over the weekend. In the end, the 2009 Ann Arbor Give Camp was a great success. Sixty developers joined together to write code to help out eighteen charities. People worked hard and slept little and learned a lot and had fun and made the world a better place. Charities came away excited by their new software and inspired by the time committed by the development community in Michigan. This can only increase excitement for next year. Martin Shoemaker is the UML Guy. In this interview, Martin explains what UML is and how to use it to improve your development process. Next week will be a busy one for me. I wrap up my current billable project on Monday and I need to prepare for Friday and Saturday when I will present three different talks in two cities on two days. In addition, I am scheduled to speak at the October meeting of the Microsoft Developers of Southwest Michigan. Sadly, a death in my family forced me to postpone last week's MEF talk at the West Michigan .Net User Group. Thank you to Jeff McWherter for filling in on short notice. In this interview, Jesse Murray shares his opinions on how to implement SharePoint solutions "the right way". I spoke with Michael Eaton halfway through the 2009 Ann Arbor Give Camp. We talked about what went into this year's event and his ambitious plans for next year. Brian Genisio is developing Silverlight and WPF applications using the Model-View-ViewModel pattern. In this interview, Brian describes the pattern and how to use it. My sister Denise passed away very suddenly Saturday morning. I very much appreciate all those who have offered their love and support over the past few days. Below are the details of her funeral and visitation. In this interview, Corey Schuman describes Silverlight. He discusses the difference between Silverlight and other technologies, such as Windows forms, ASP.Net and Flash. In this interview, Jim Wooley discusses the relevance of stored procedures and best practices for accessing a database. 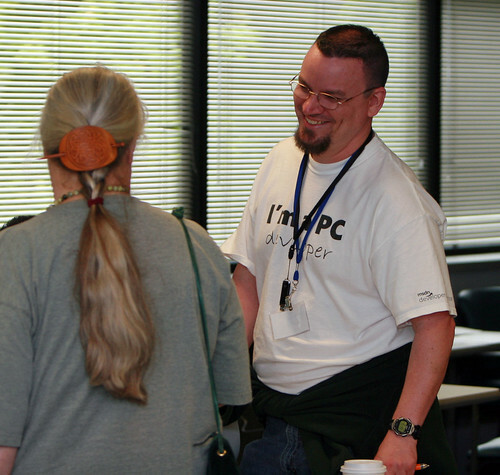 Contribupendence Day is the brainchild of Microsoft Developer Evangelist Jeff Blankenburg. He came up with the idea a year ago and this is the second year in which I have participated. Jeff pointed out that most of us sometimes get to work with outstanding people (true for me) and that we often don't take the time to recognize the contributions of those people (also true for me). To correct this, he deemed July 3 "Contribupendence Day" - a day in which we can contribute to the independence from mediocrity of outstanding colleagues. Jeff suggested that we do this by choosing a few excellent past or present co-workers and writing a recommendation on a networking site. I chose four former co-workers and wrote a recommendation for each on LinkedIn. I won't list their names here, but you are welcome to view my LinkedIn profile and see what I wrote. I don't expect anything in return but I didn't expect anything last year and I ended up reaping benefits anyway. I wrote a number of recommendations last July in response to Jeff's call. A couple months later, I found myself out of work and looking for a job. One strategy in my job search was to request LinkedIn recommendations from former co-workers. I believe that I received better responses from these requests because I had so freely given recommendations earlier in the year. I was touched and delighted by the outpourings of those willing to write nice things about me in a public forum. During my job search, several interviewers told me they read my LinkedIn profile and were impressed with the quantity and quality of the recommendations I received. So take a few minutes today to speak honestly about those who have impressed you. You never know when or how the favor will be returned. This is only the second year of CodeStock but Mike Neel managed to expand the Knoxville conference to a 2-day event and more than double attendance to 376. In this interview, Mike talks about the conference and the developer community in the Heartland region.